Being a log home owner doesn’t mean log rot has to be a part of your life. There are many ways to prevent log rot, the best one being during the design phase. If you are just starting down the path of building a log home, ensure the overhangs are properly designed to provide the best protection. They shade the upper log walls from the damaging ultraviolet rays of the sun, and keep rain away from the logs. Also, try to avoid having log ends stick out past the overhangs. This will prevent the waterfall effect that occurs when water from the roof splashes down onto the top logs and runs all the way down, eventually causing the whole corner to rot (see picture). • Maintain the caulk and chinking between courses and around windows and doors. Only use sealants made for log homes, as these products have the elasticity necessary to move with the natural expansion and contraction of the logs. • Protect your log home from the elements with only log home preservatives, as they allow the logs to breathe, unlike deck preservatives which are meant to seal the wood. Additionally, log home preservatives usually contain chemicals to help prevent mold, mildew and decay. • Know the right product to use and understand the manufacturer’s application procedures, as the wrong product or improper application will eventually cause more harm than good. • Keep shrubs and other vegetation at least 12 inches from log walls to supply adequate air circulation. Think you may already have log rot? 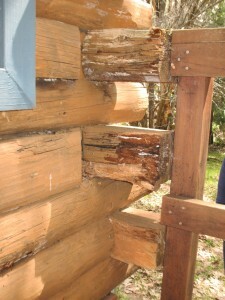 Read our next blog posting in two weeks entitled, “GOT LOG ROT? LOG REPAIR VERSUS LOG REPLACEMENT.” We’ll tell you about an easy method you can use to help determine if your logs are healthy, or may need to be repaired or replaced. TIME TO CONSIDER LOG HOME MAINTENANCE…?